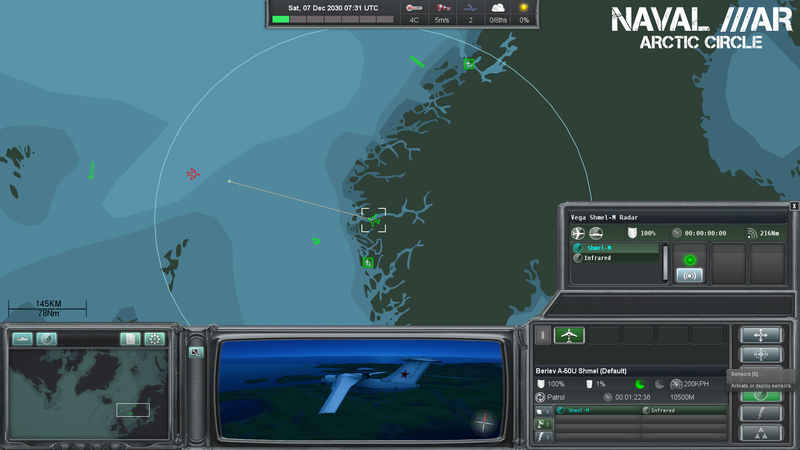 The good folks at Paradox Interactive were kind enough to share with us a preview key of their new military strategy game, Naval War: Arctic Circle. Two things conspired to turn that preview key into a review key. The first was a massive game convention in Boston, the second was the stunning depth of the game in question. I don’t always have access to the sort of Powerhouse PC you would expect a game reviewer to have. Sometimes games have to be reviewed on my workhorse. Thus, it is always with a bit of nervousness that I load up the latest PC game. No such need here. 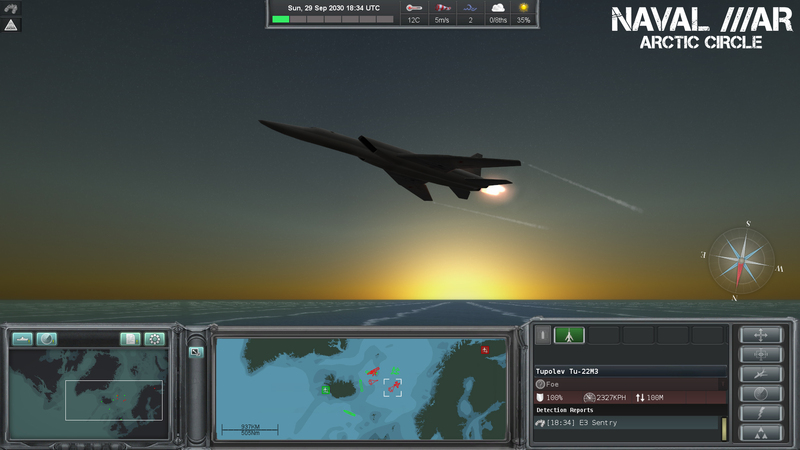 Naval War has got visuals that are both simple and authentic. Most of the game is played via a “war room” style display. You’re looking at simple vector-style shapes in green and red, depicting friend and foe. Sure, there’s a little square at the bottom center that shows 3D renderings of the equipment and activity currently in focus, but mostly you are staring at a large, uncluttered radar screen, tapping nifty little outlines and selecting from large menus. (If you are so inclined, you can switch the rendered view to the main area if you want to watch the pyrotechnics during a battle, but I left it as it was.) The ol’ office PC was well up to the task. Though not as pretty as the other screen shots, this one is how you'll spend most of the game. Considering the frankly boggling level of depth to the tasks and options in this game (as you’ll read in the next section) it is rather impressive how large and legible they have been able to make the menu system, too. Things like aircraft below deck and on deck in your carrier are handled mostly with icons, rather than works. A great deal of the info and options are depicted visually, allowing for quick navigation of menus and lists once you know the symbols. 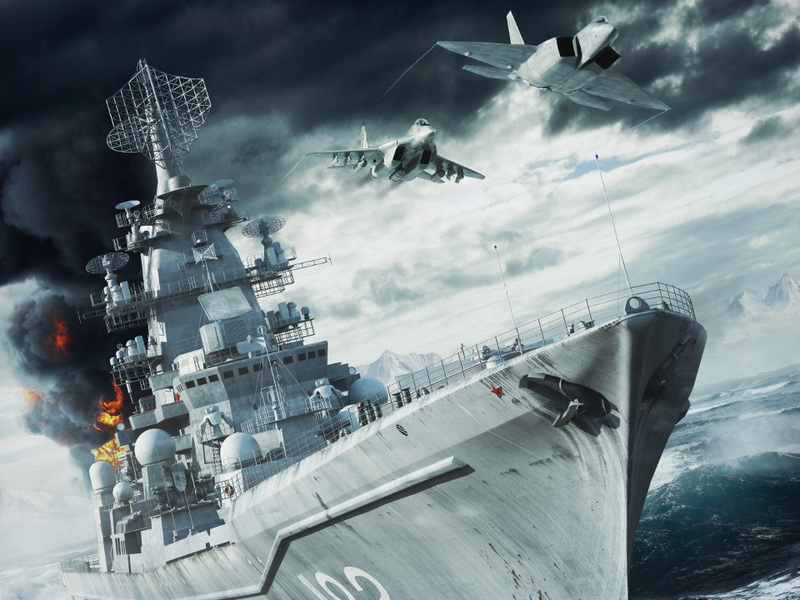 Remember when you were a kid, and you played Battleship? The chances are good that even back then you were vaguely aware that naval combat was more complex than shouting “B3” and hoping your opponent wasn’t a liar. Well, now I’ve got an idea of how the big boys play the game, and I have a new respect for the admirals. What the game lacks in graphical complexity, it makes up for with raw strategic depth. This is a plus if you are willing and able to set aside the time to learn the ins and outs of ship combat. If you aren’t? Well, get ready for the mother of all learning curves. 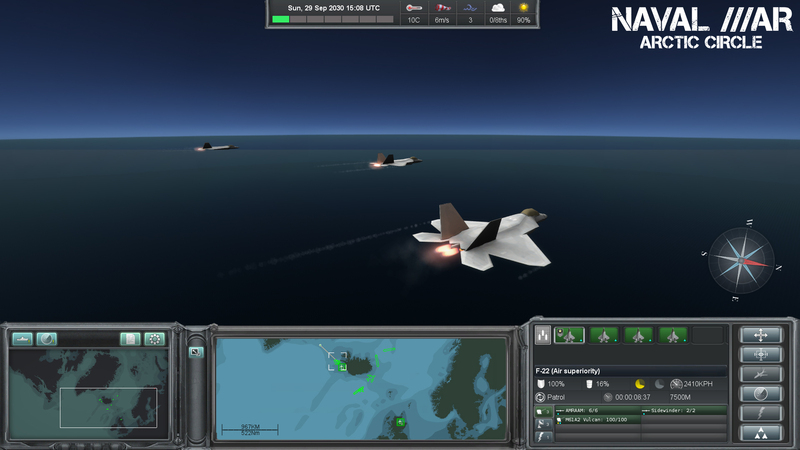 Not since Making History II have I played a war-sim that took me so long to get rolling. There are some games that I can skip the tutorial. This one, it took me hours to BEAT the tutorial. The game is arranged into two campaigns, the first of which begins with the aforementioned tutorial. 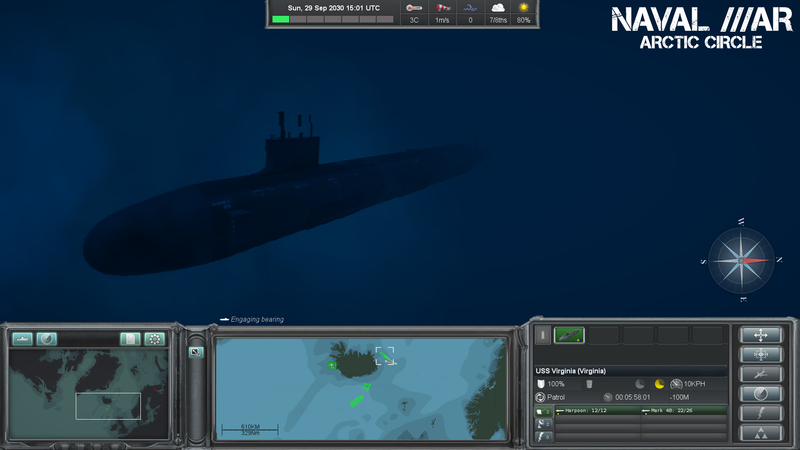 You begin each mission with a task, usually something fairly standard, like “destroy a submarine” or “sink a carrier.” Here and there, sub-requirements will be thrown in, limiting the number of units you can lose, for example, or avoid engaging any civilian vessels in the area. That much is par for the course in a game like this. The tricky part is pulling it off. You don’t get the handy exceptions from reality that most games provide, like having an omniscient knowledge of the location and intention of each friend and foe. That blind-firing that we all remember from Battleship takes the form of dispatching helicopters to drop sonar buoys, or sending out reconnaissance craft. Once you find a sub or ship, you need to tag it as friend or foe, then send in the units to attack. Friend or foe, with me at the controls, this ship is sinking soon. Every element of the game has got enough realism to make you rethink age old strategies forged in less authentic games. 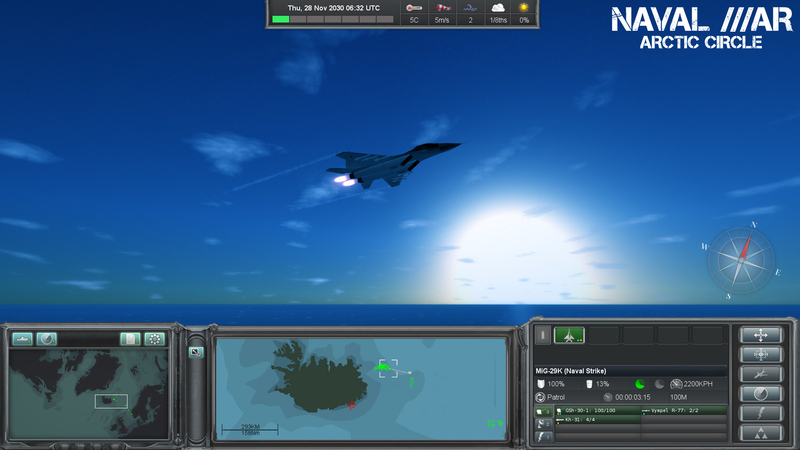 Vehicles have extremely limited fuel and ammunition, and only specific classes of weapons can be used effectively against certain classes of enemies. It doesn’t matter how big those machine guns are, they aren’t going to do any good against a submersed sub. You need torpedoes. Want to send out planes? Well, first you queue them for take off, then send them out, give them firing orders. Not just who to fire at, but what to use. And act fast, because if they take out your surveillance or leave the sonar range, you’re back to square one. Digging into the menus, you can set troop behavior to streamline this process, such as firing automatically on all cleared targets, but micromanagement is an option, and the default one to boot. As the game unfolds, the number of plates you need to keep spinning, and the way you manage to do it, grows astoundingly. Tanker planes can keep your air superiority fighters in the air. You can tweak altitude, turn off active radar to avoid detection, and dozens of other things. Most of this depth is, naturally, a good thing for players after a genuine military experience. In some cases, though, shortcomings in the games tutorial make things a bit harder than they need to be. When I was attempting to send out my first helicopter, I was told to give them a way-point, but it took me a considerable amount of trial and error to discover that I was using the wrong mouse button to do it. There were a few such things that served as examples of unintuitive gameplay. Once you’re familiar with quirks, the game plays smooth, but I have a feeling a lot of people who are on the fence about the game would fall off during those first frustrating minutes. Sun's setting, boys. Time to blow some stuff up! One last thing worth mentioning. This is a game that, in its default form, almost seems to be turn based rather than real time. That’s just because it isn’t just real time in video game terms, it’s real time as in reality. If you want your planes to be zipping along and your torpedoes to rocket their way home, you need to crank the game clock WAY up. I didn’t really have high hopes for the audio in this game. Looking at the screens, I was expecting some military style drums and horns. That wasn’t what I got. The music in this game runs from subtle, Tool-like chords to build tension and builds to full-on Black Metal. It suits the “heavy weapons tearing into heavy machinery” tone of the game quite well. Though not precisely the stuff of Hollywood blockbusters, this game does indeed have a story. Set in 2030, it chronicles the rise of a war in the north as the superpowers vie for dominance. The story is told with simple “sliding newspaper” style info-dumps and captioned scenes depicting interaction between navy personnel. To their credit the game makers gave the characters in the briefing sections realistic personalities and attitudes, busting each other’s chops and generally reflecting the mindset of a soldier. If you are looking for a casual game, keep looking. If you want a game that lets you play armchair Admiral with an unprecedented level of authenticity, congratulations, you’ve hit pay dirt. 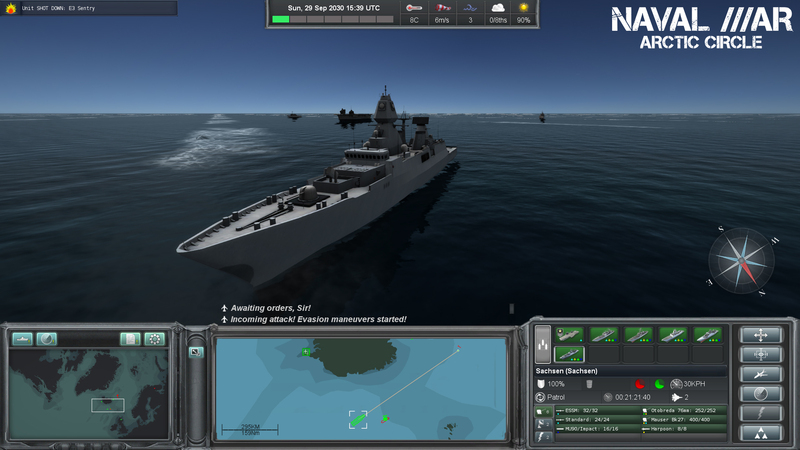 8 / 10: Not for the faint of heart, but for those with the patience, dedication, and craving for a true naval strategy game, this is the game for you. Though not as pretty as the other screen shots, this one is how you’ll spend most of the game. Sun’s setting, boys. Time to blow some stuff up!